The wires in Breadboards have a tendency to fall out if moved or quickly become a birds nest if the circuit is complicated. Breadboards don’t stack neatly like shields, so they are difficult to mount in the chassis. I found some great prototyping boards from FreeTronics.com (ProtoShield Pro for Arduino). These have a reset button, a general purpose button and general purpose LED mounted around the edge of a grid of holes. This is great for prototyping. The boards are well designed with easy access to power rails and they’re cheap. I buy long pin through hole sockets for wire wrap and solder just two legs of the socket (at diagonal corners) on to the prototype board, just to hold the socket in place. You then use special thin wire wrap wire and a tool that twists the wire on to the pin, to wire your circuit. There’s no soldering to wire the circuit (just a dab to hold the socket on to the board) the friction of the wire wrapped around the pins holds it tight. You can cut the wire to roughly the right length for each connection, so the board stays tidy and does not resemble a birds nest. If you make a mistake, you can use the tool to unwrap the wire and you just replace it with the correct connection. 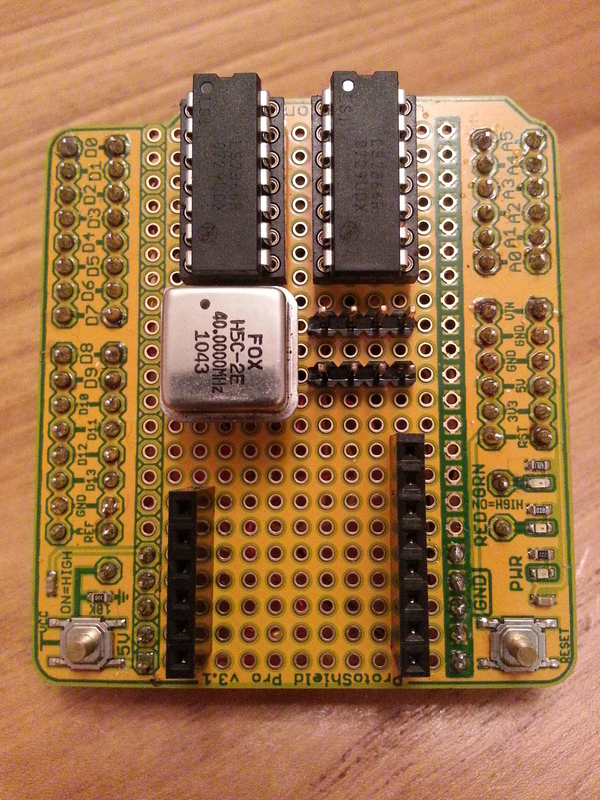 Once the circuit is complete, the board plugs in as a normal shield, and it’s robust enough not to fall apart in use. 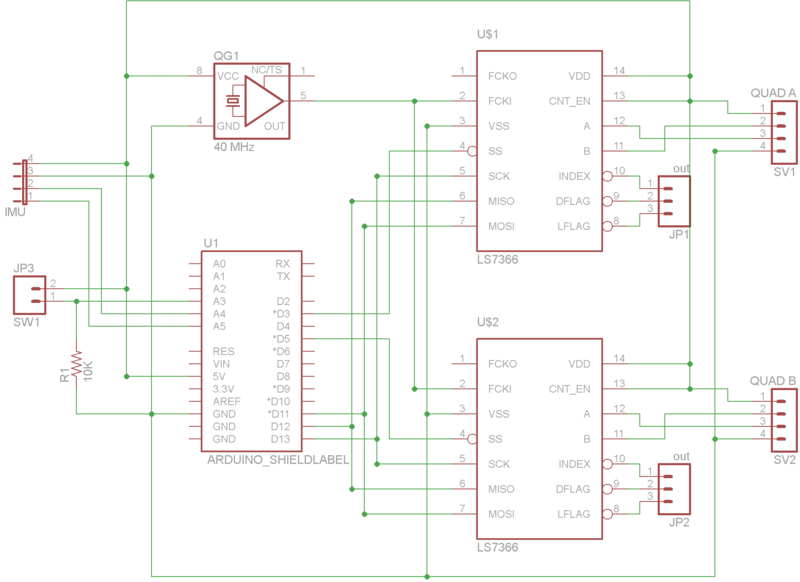 The LS7366 Quadrature Decoders are chips made by LSI. There is a decoder IC for the quadrature encoder on each motor. The ICs have a 32 bit counter, so they can count about 4,294 million pulses before rolling over. They have an SPI interface so it’s just 5 wires to connect them both to the Arduino (three common SPI data lines and two slave select lines). The SPI interface uses common data and clock lines from every device (slave) to communicate to the Arduino (master). The master controls who can talk on the data lines, through a unique Slave Select (SS) line connected to each device. When the slave select line is held low that device talks to the master. When the slave select line is high, the slave ignores the data lines and puts the pins in a “high Z” state, i.e. they are isolated from other signals or devices connected to the common data lines. These three lines are all connected in parallel. SS – Slave Select is unique to each slave and is connected back to a separate pin on the Arduino. In this case, I used Arduino pins 3 & 5 for the two quadrature decoder slave select lines (one for each motor). The SPI data and clock pins are pins 11, 12 & 13 on the Arduino. I had a few issues with the wire wrap prototype, misreading my own initial circuit diagram, but I soon got it working. The code is simple, but understanding the data sheet took some time. To setup SPI on the Arduino, you have to set three parameters, the Mode, the Bit Order and the Clock Frequency. They are all defined in the data sheet for your device. The Bit Order defines whether binary numbers are sent down the serial interface most significant bit first, or least significant bit first. There is an SPI library in the Arduino, which makes all this easy. 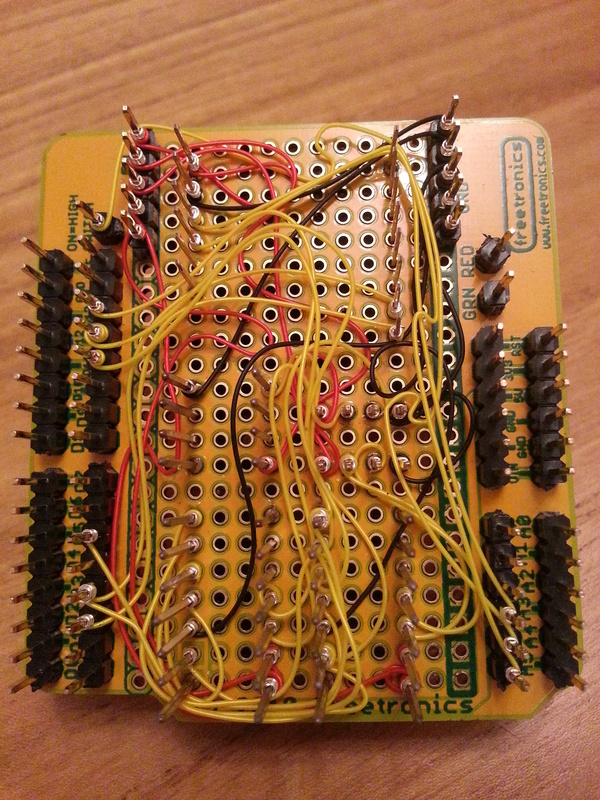 This sends a byte (8 bits) out of the SPI bus. You’ll notice all SPI communications are 8 bits. Our counter is 32 bits, so I wrote some helper functions to read the 4 byte counter values. You just need to read the multiple bytes sequentially. Here’s the helper function that reads the 32 bit counter values, which takes the slave select line as a parameter, so I can use it for either quadrature counter. It sends the read command and then reads 4 bytes in sequence, building them in to a 32 bit unsigned long. I don’t actually need the quadrature counters in phase one of the project to get the BalanceBot balancing. It will balance without them. However, it will probably drift from its original position as its balancing. The plan is to count the quadrature pulses as it drifts and then bring it back to its original position once it’s stable. This should mean if the robot gets knocked, it will move back to rebalance, and then slowly come back to where it was, maintaining its position. This entry was posted in BalanceBot and tagged Arduino, BalanceBot, Quadrature Decoder, Robots on February 5, 2013 by mostlyrobots2012. I used a Pololu Dual VNH5019 Motor Driver Shield for Arduino as the motor controller. It has two VNH5019 MOSFET H-Bridge brushed DC motor controller IC’s mounted on an Arduino Shield. The motor controller can drive up to 12A continuous current per motor, 30A maximum. The motors are controlled via a PWM signal generated by the Arduino, and sent to the controller ICs, which in turn drive the MOFETS to control the speed and direction of the motors. The controllers can work up to 24v, but we are using 12v motors with a stall current of 5A, so the controller shouldn’t even break in to a sweat. The shield comes with an Arduino library, making the programming simple. There is a function setSpeeds (int m1Speed, int m2Speed); which takes an integer speed for each motor, from +400 (full speed ahead) to -400 (full speed reverse), with 0 being stop. There are quite a few other functions on the controller including braking and current monitoring, but I doubt we’ll use them in this project. The only down side of using this particular shield is it takes lots of IO pins. There is a PWM signal for each motor, direction indicators, the current sensing output, enable lines and error signals. All in all the shield uses 10 IO pins of the 20 pins in total. This isn’t a show stopper, we still have enough left over (just) but there is one problem. The shield uses pin 12 for the M2EN signal. We need pin 12 for SPI. The SPI signals are pins 11,12 & 13. There is the feature on the board to cut the track for control signals so you can move them. I had to cut the track and solder a thin wire from the jumper to the new pin. I picked pin A2 as we don’t need that and I updated the library with the new pin details. The controller worked fine first time. It’s powered directly from the battery. 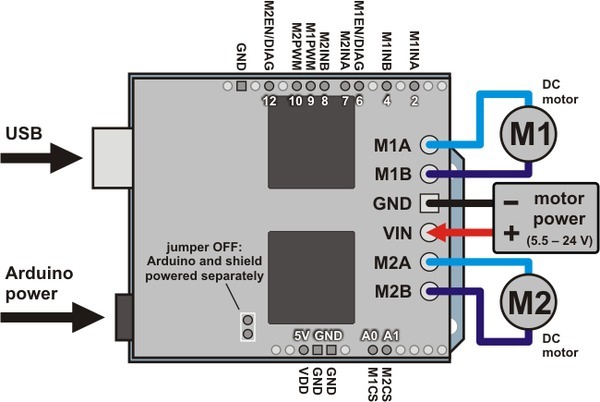 There is a jumper on the shield to power the Arduino from an on board regulator, so the motor battery powers the Arduino too. The library makes programming easy, and the motors are fast and responsive. The only thing you need to remember to do is wire one of the motors to the shield in revere. For the robot to travel forward with both motors at “+400”, one motor needs to be wired in reverse to the other as they are on either sides of the robot, clockwise is forwards for one motor, and anti-clockwise is forwards for the other. This doesn’t affect the motors at all, and it makes the code slightly easier to read. This entry was posted in BalanceBot and tagged Arduino, BalanceBot, Robots on February 5, 2013 by mostlyrobots2012. 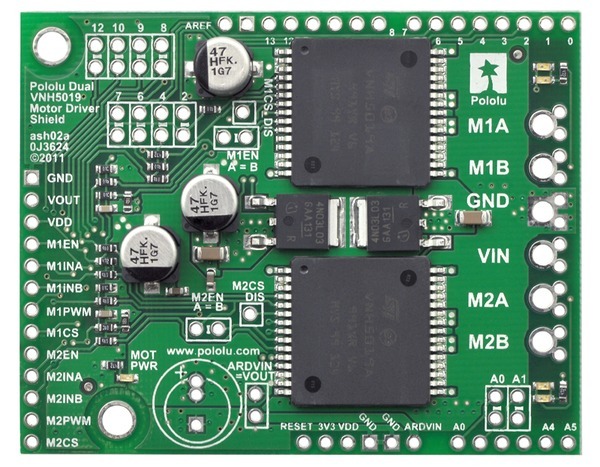 The motors are Pololu metal gear motors and Pololu have a nice motor controller shield that matches the requirements of the motors. The motor shield has a built in regulator to power the 5v Arduino from the motor power coming from the battery, so I could power everything from a single 12v rechargeable battery. A perfect fit. Pololu also sell mounting brackets for the motors and wheels. So that’s the mechanics covered in a single order. The brain is an Arduino Duemilanove with an ATmega328p microcontroller but this is essentially the same as the newer Arduino Uno. I read a lot about various IMUs and considered using an all-in-one unit with a built in CPU and code. I have an UM6-LT Orientation Sensor from CH Robotics for a different project and they are easy to interface to and do all the Kalman filtering for you on board, but I needed it for the other project, and they’re expensive, so I decided to use a raw 9 DoF sensor board and do the data fusion and filtering in code on the Arduino. These 9 DoF boards are cool from FreeIMU but at the time I was researching this, there weren’t many online stores selling them, so I decided to use a SparkFun Sensor Stick. The FreeIMU site provides a GNU GPL license library for Arduino which supports not only the FreeIMU boards but also the SparkFun boards and the DIYDrones ArduIMU. I was hoping to find an existing 3rd party Quadrature decoder Arduino shield, but I couldn’t one. I found some quadrature counter ICs LS7366 with an SPI interface. These count the quadrature pulses from the motors so the Arduino can read the count totals using SPI. I prototyped a shield for them using wire wrap and then manufactured a custom PCB using BatchPCB.com. The other components are from Maplins. A standard sealed 12v battery and some switches. Finally, to make it look more professional I have some custom acrylic sheets laser cut for the base and top. These made mounting the PCBs and switches easier and made it look less Heath Robinson. A sad note, Fabio Varesano (http://www.varesano.net/) the 28 year old student behind FreeIMU died suddenly over Christmas last year. Such a terrible shame for such a talented young man. He invested so much effort designing and developing FreeIMU and provided lots of support and encouragement to the robotics community. The information from his site was part of my research for this project and I’m sure he will be missed by the community. My heartfelt sympathy goes to his family and friends. 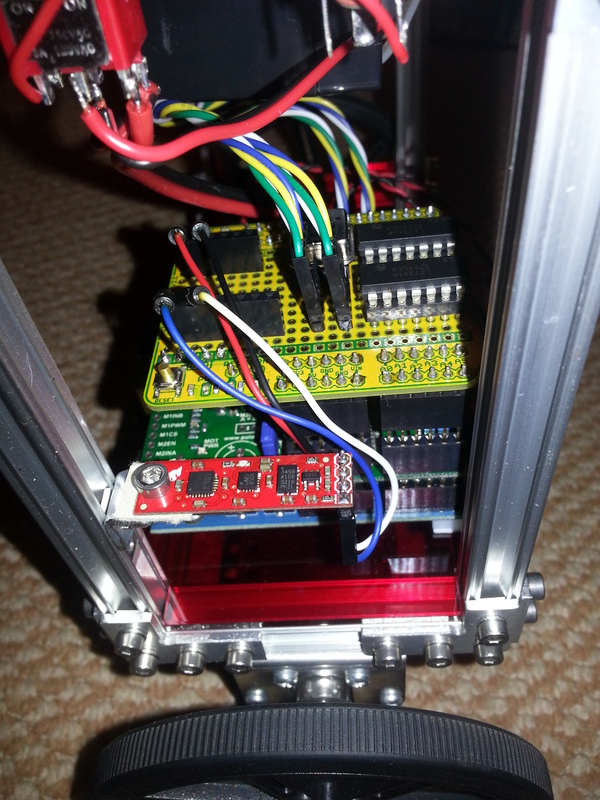 This entry was posted in BalanceBot and tagged Arduino, BalanceBot, Robots on February 4, 2013 by mostlyrobots2012.